Located in China’s Guangxi province, the Longji (Dragon’s Backbone) Rice Terraces are one of the countries most beautiful terraces. I visited the Longji Rice terraces in late June, which is a great time of year to visit if you want to see the terraces covered in green. If you plan on visiting the Longji Rice Terraces, I’d recommend doing the hike from Dazhai to Ping’an (or vice versa). The terraces can also be seen as a day trip from Guilin or Yangshuo, but I’d recommend spending at least one night in the area if you’re able to. The Longji Terraces are located in Longsheng County, which is about 100 kilometres north of Guilin. It takes about 3 hours to get there by bus. 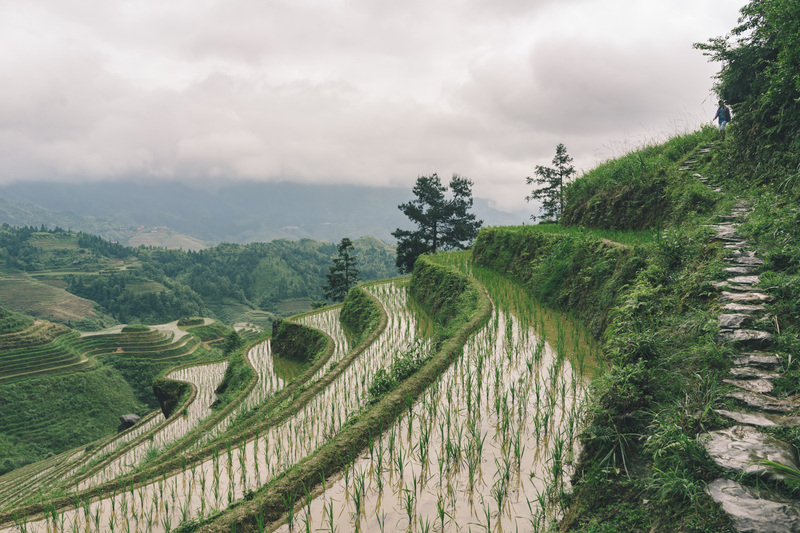 First, you’ll need to take a bus from the Qintan Bus Station to Longsheng Town, and then take another from Longsheng Town to the Longji Terraces area. I didn’t arrive in Guilin until 2 pm, so rather than make my way to the bus station and then take another two busses, I took up an offer from a minivan driver outside of the train station. It cost me 50 RMB, which isn’t that much more than the bus, and it took me directly to Dazhai village. Don’t worry about finding a minivan driver – they’ll find you. At the entrance of the scenic area, you’ll have to pay the entry cost. It’ll cost you 100 RMB, or 50 RMB if you are a student (they accepted my student ID). I’d recommend checking out the Dazhai Dragon’s Den Hostel. I planned on staying at that hostel, but it’s a 40-minute uphill walk from Dazhai village. Unfortunately, I didn’t get to Dazhai until around 5:30 pm, so decided to just find a place in town. I ended up paying around 100 RMB for a private room in a guesthouse (which was actually quite nice). The hike from Dazhai to Ping’an takes 4-5 hours (depending on conditions…) and gives you a glimpse into the lives of the local Yao minorities. To get on the trail, follow the main road going through Dazhai and it will turn into an uphill pathway. You should cross a small wooden bridge after 10-15 minutes. If you’re unsure if you are going the right way, ask a local for directions to Ping’an. About halfway through the hike, you’ll come across Zhongliu Village. When I arrived here, it was pouring rain so I took shelter in a small shop and bought some Oreos to snack on. If you have a choice, try not to do this hike on a rainy day. The pathway becomes a river, you’re guaranteed to get wet. It was raining on and off the day I did the hike, and my shoes got completely soaked after only a few minutes. At least it was warm! After Zhongliu, it’s just a few more kilometres until you arrive in Ping’an. Ping’an is the largest village in the area, so you can get food or find accommodation here easily. By the time I got to Ping’an, it was around 3:30 pm (I started the hike pretty late). I had trouble finding transportation back to Guilin (every bus I could find was waiting for a group) but lucked out when I found a group of foreigners with extra space in their vehicle. Probably best to start the hike early, so you have some extra time in Ping’an to find a ride back. The Longji Rice Terraces can be visited year-round, but at certain times of the year, the terraces are far more beautiful than others. In the spring, the terraces are irrigated and are mirror-like pools of water. I visited in late June, so the paddies had just started to grow out. As summer arrives, the terraces become completely covered in green as the paddies grow to half a meter high. In the fall, beautiful golden colours take over the terraces. In the winter, the terraces become rather lifeless, but after a fresh snowfall, they look incredible. I’d recommend visiting in the spring or fall if you can, but still, don’t skip the terraces if you’re nearby in the summer or winter, they’re always worth visiting! Still planning your China trip? Check out my ultimate China backpacking itinerary for some inspiration!